We’re all looking for easy chicken recipes for dinner, right? 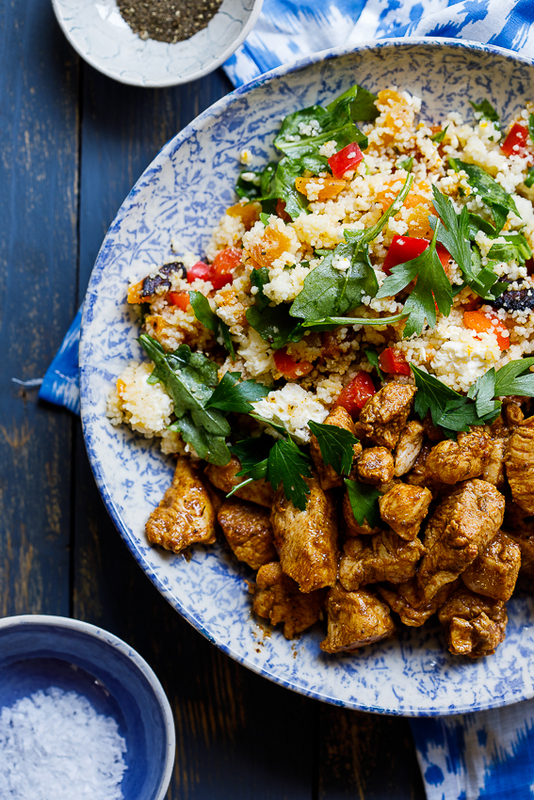 Chicken is easy, healthy and versatile. 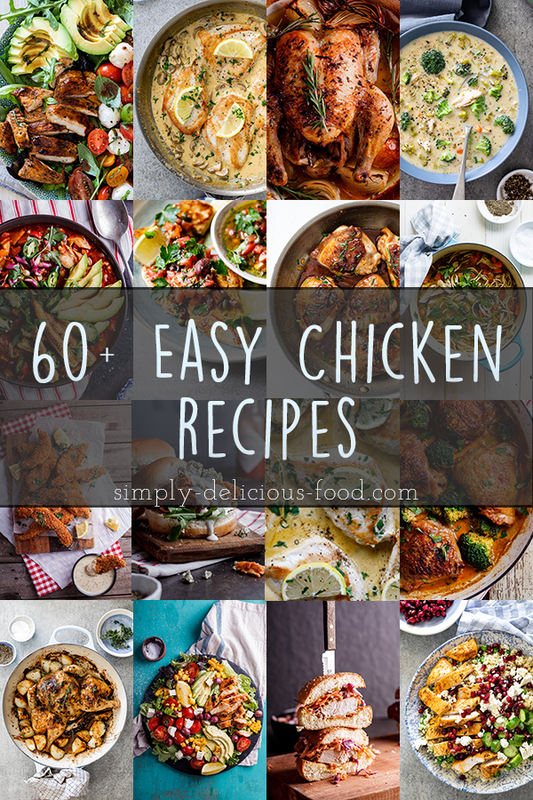 From curries to salads, the options are endless and you’re bound to find a favorite amongst these 60+ chicken recipes. We eat chicken a LOT in this house. We have it at least twice a week because not only is it delicious, it’s truly the most versatile protein around. 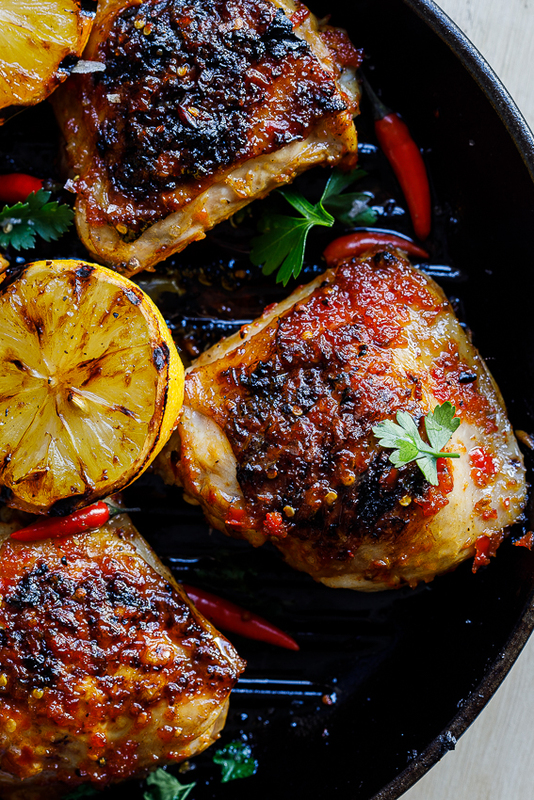 Whether you grill it quickly for salads or wraps, cook it in a luscious, aromatic curry or make a one-pot meal with juicy chicken thighs, chicken is always a good idea. 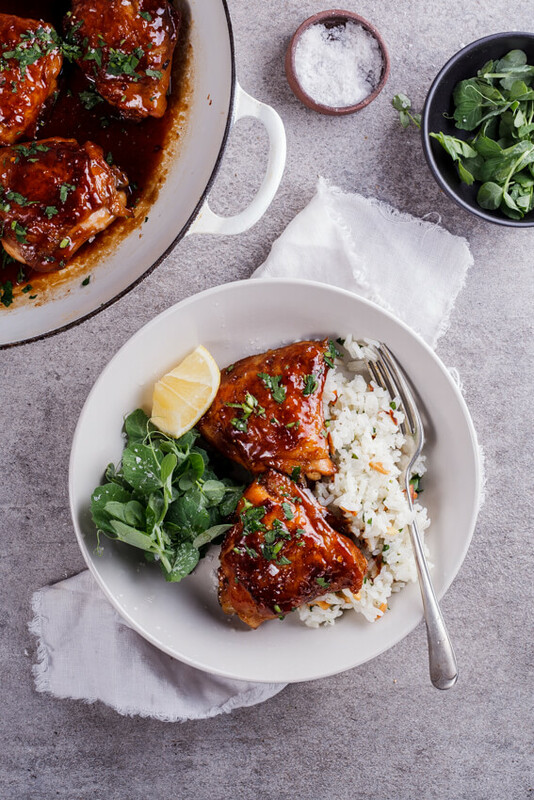 This easy stove-top honey garlic chicken thighs is a great weeknight dinner served with steamed rice and vegetables. 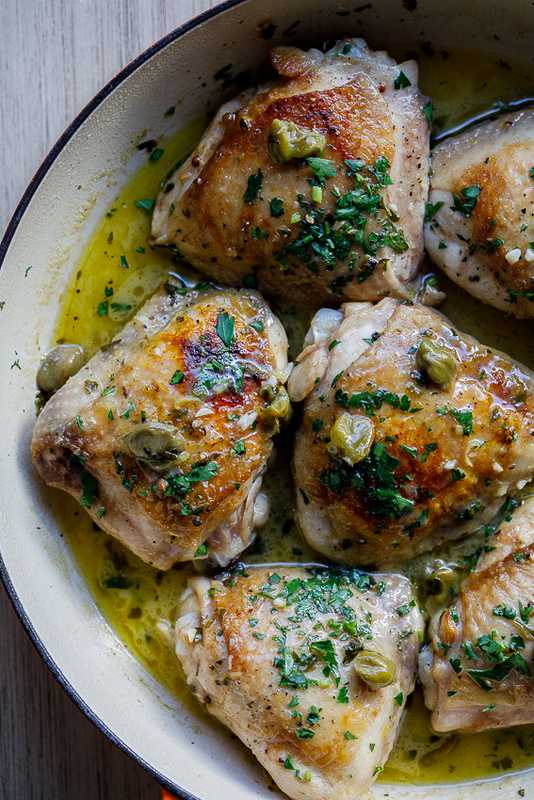 Juicy chicken thighs cooked in a lemon, white wine and caper sauce. Yum! 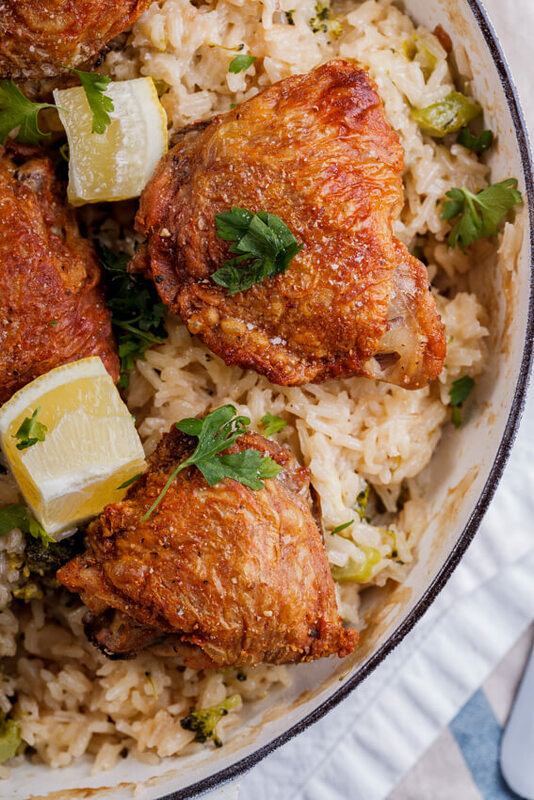 This easy chicken recipe is a family favorite, Cheesy, broccoli rice with crispy thighs? Yes please! 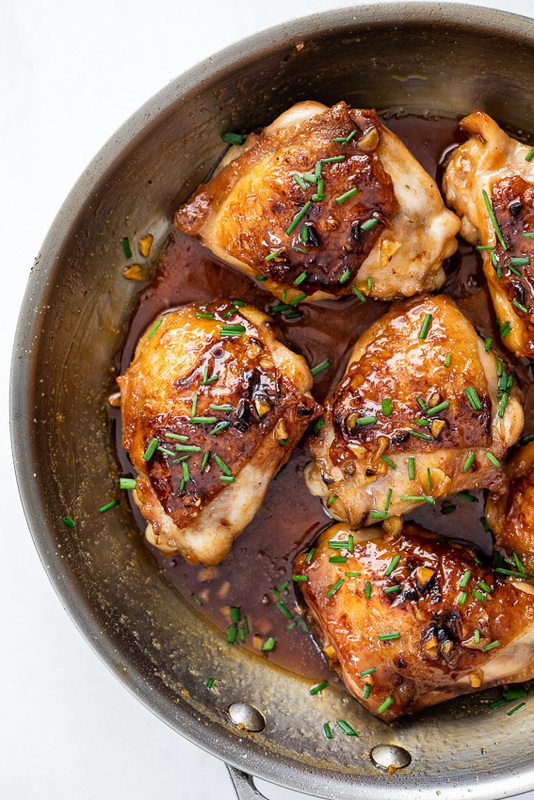 Chicken thighs cooked in a sticky apricot preserves sauce. 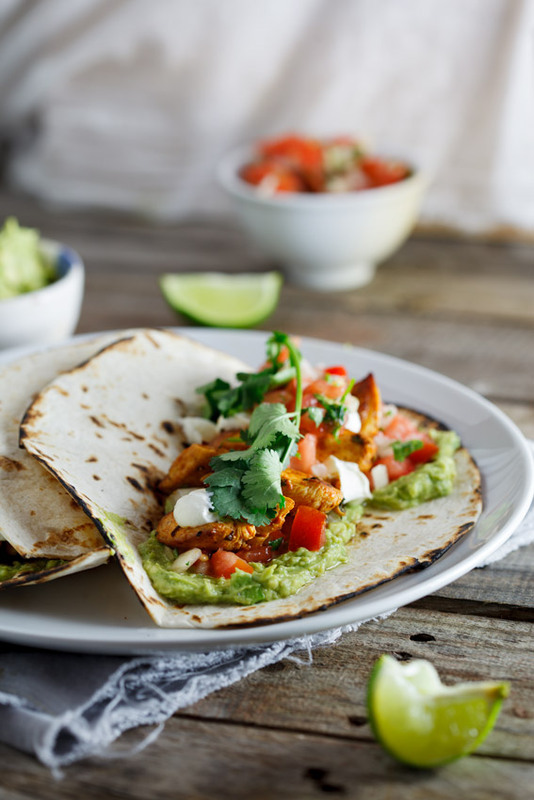 Such an easy recipe and great for quick weeknight dinners. 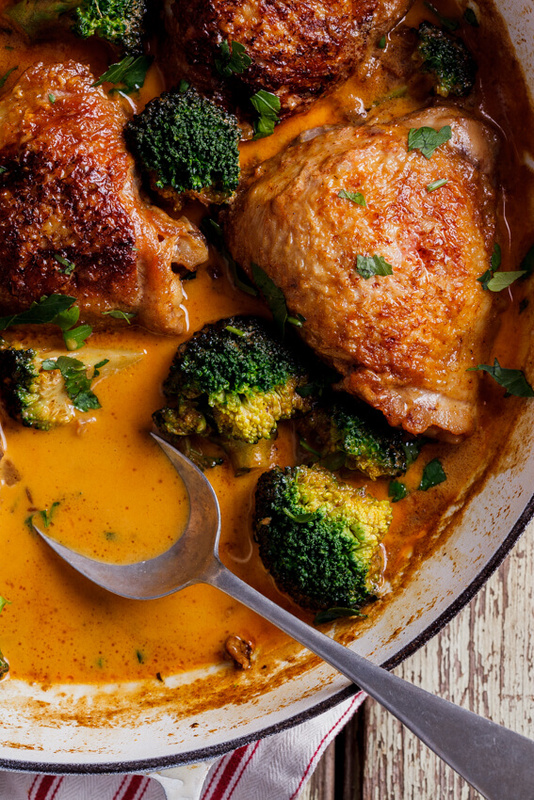 When you’re craving curry but don’t have the time, these coconut curry chicken thighs are just the thing. 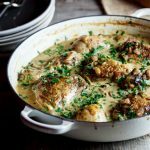 One pot, easy and delicious! 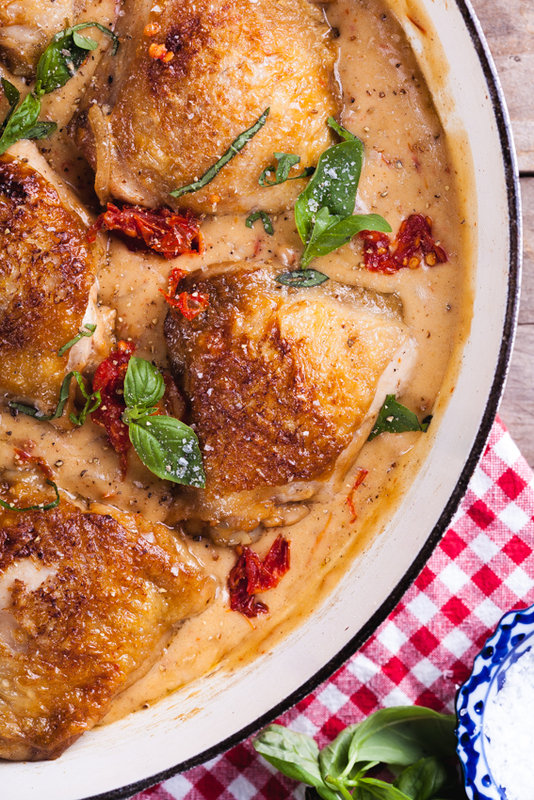 Chicken thighs cooked in a creamy sundried tomato and basil sauce makes a delicious dinner served with pasta or crusty bread to mop up the sauce. 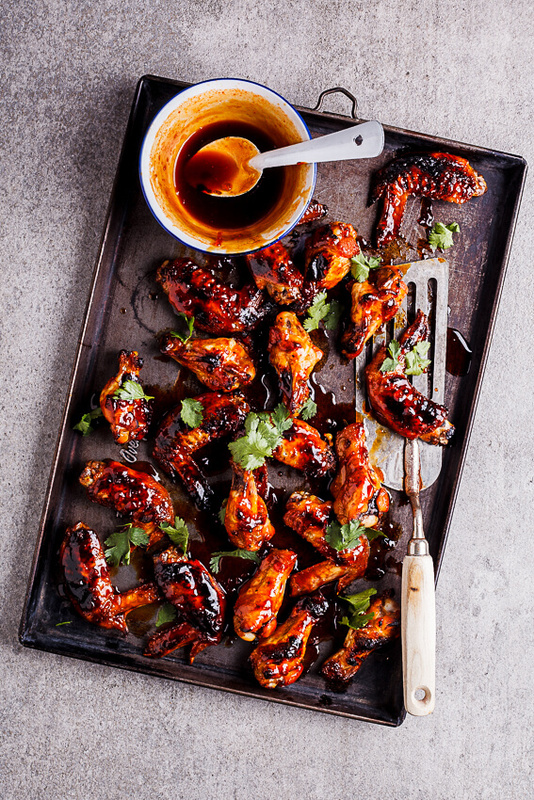 Juicy, spicy, sweet and sticky. All words I love and the reason these grilled peri-peri chicken thighs will become a firm favorite in no time. 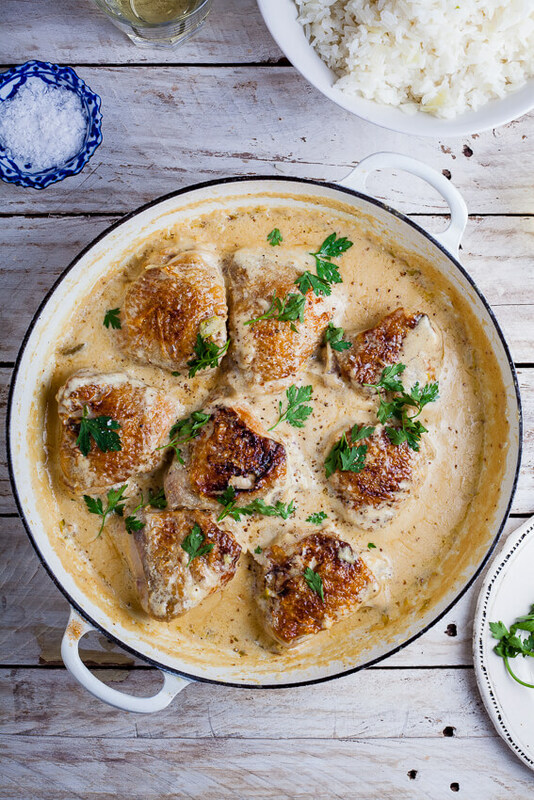 Chicken thighs cooked in creamy Dijon mustard sauce served with rice. 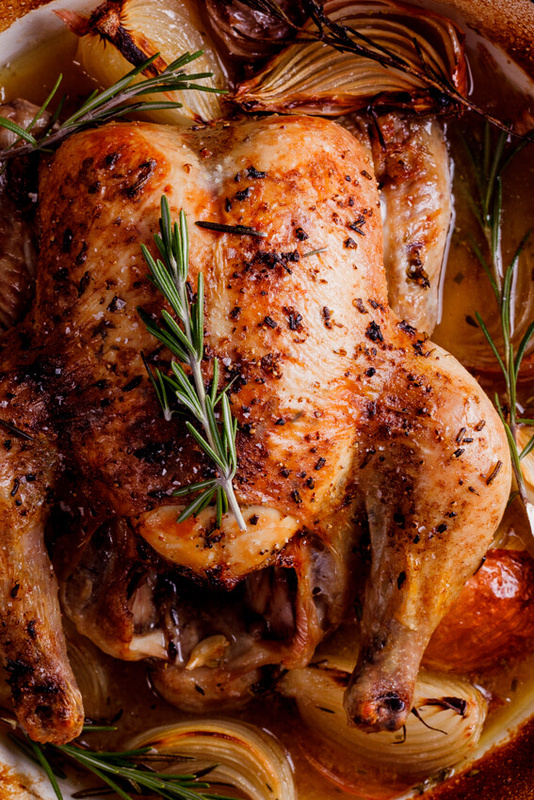 Juicy Lemon herb roast chicken is so easy to make and perfect for family dinners. 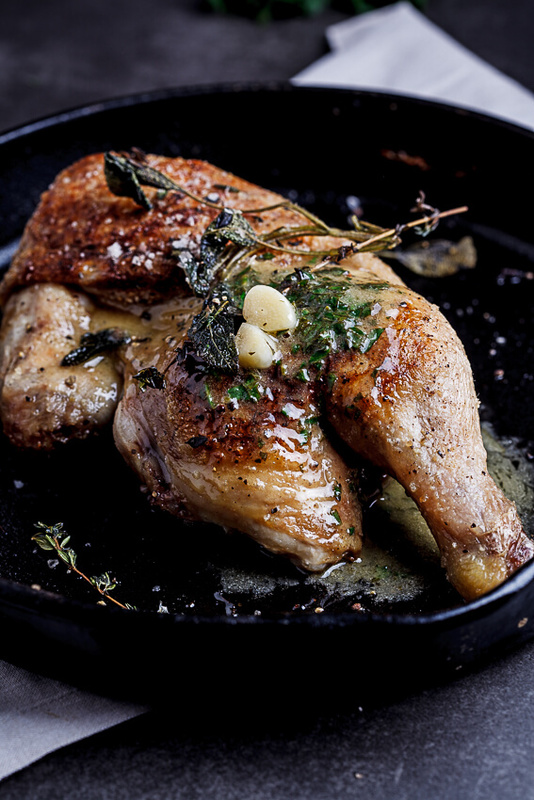 Chicken roasted with white wine and Tuscan herbs. Perfect for an easy, showstopper meal. 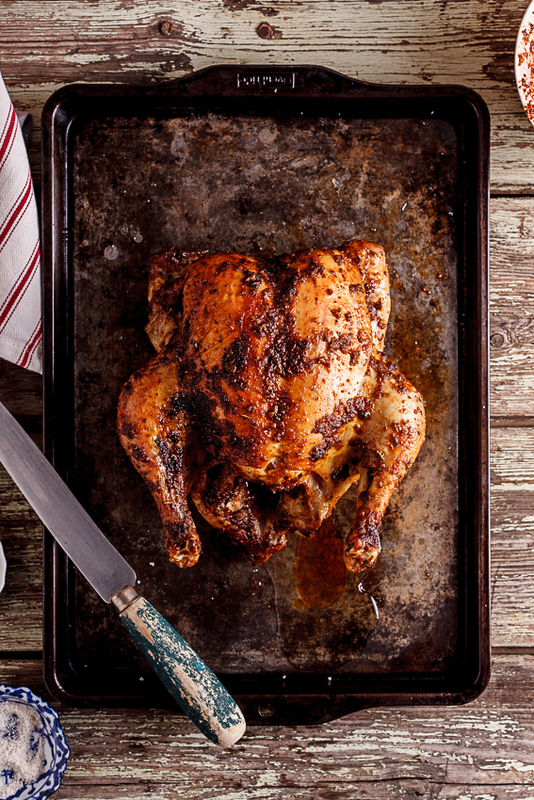 The easiest roast chicken recipe. 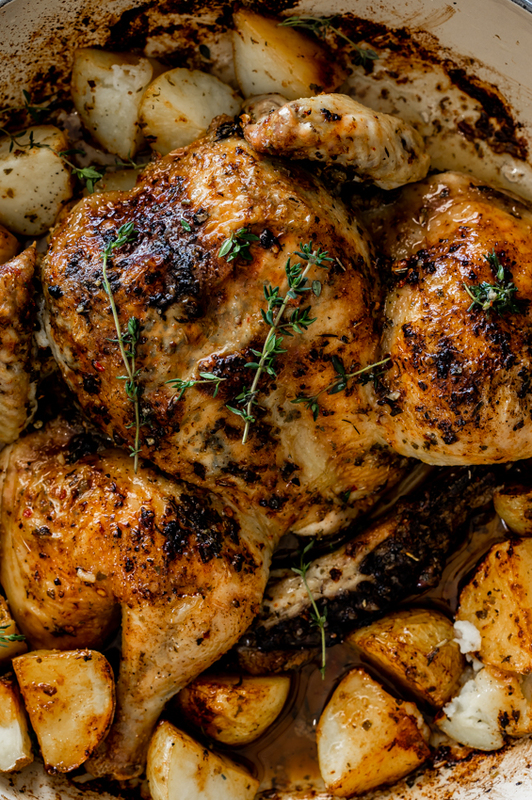 Use the spice mixes in your pantry to give new life to a classic roast chicken. 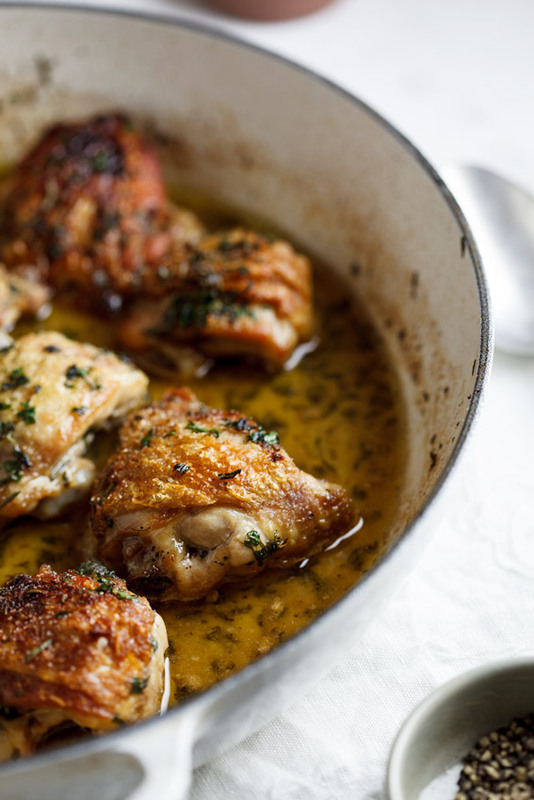 Crisp, golden chicken skin drenched in lemon garlic butter. What more can we ask for? 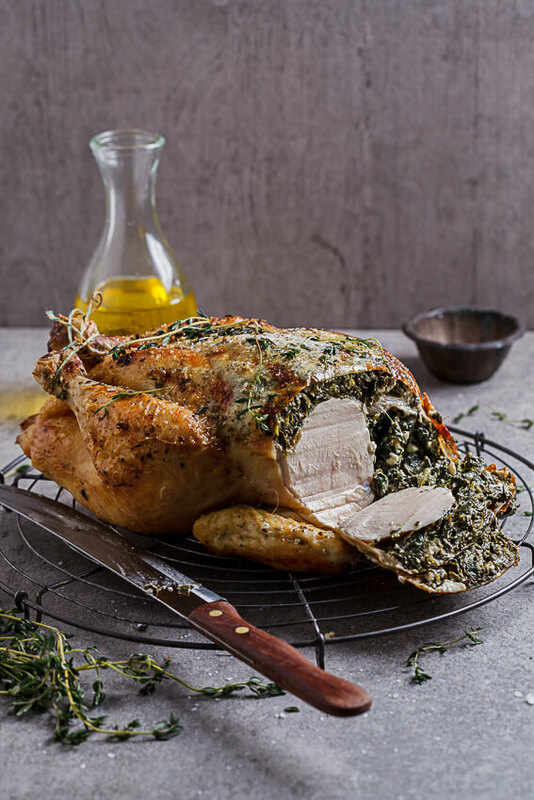 Creamy spinach and feta make a roast chicken a showstopper your guests will drool over. 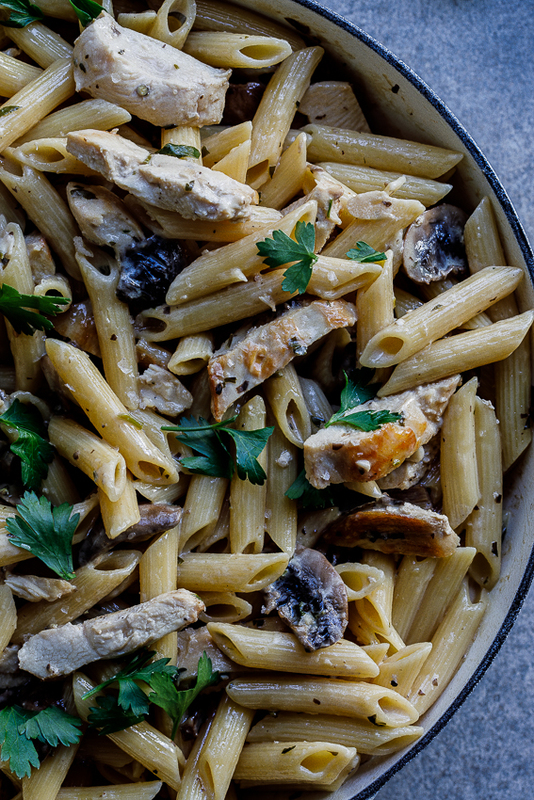 Creamy mushroom chicken is the perfect easy recipe for dinner. 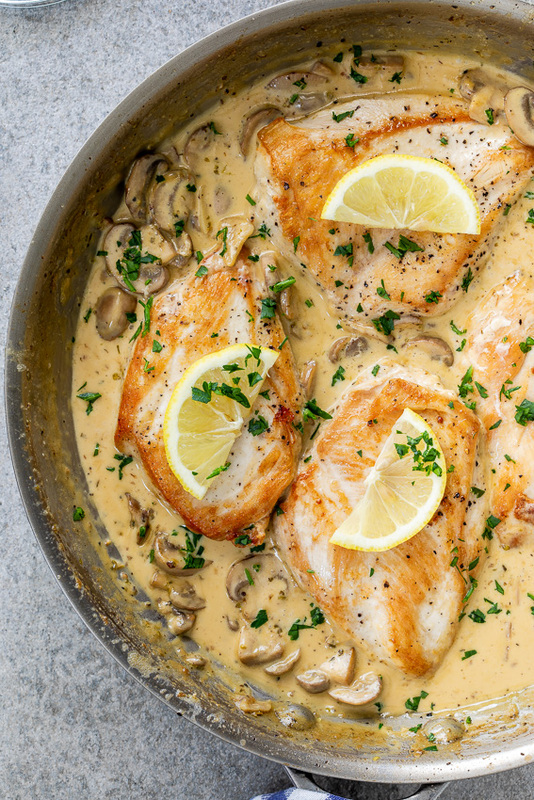 Juicy chicken breasts in garlic and herb creamy mushroom sauce. 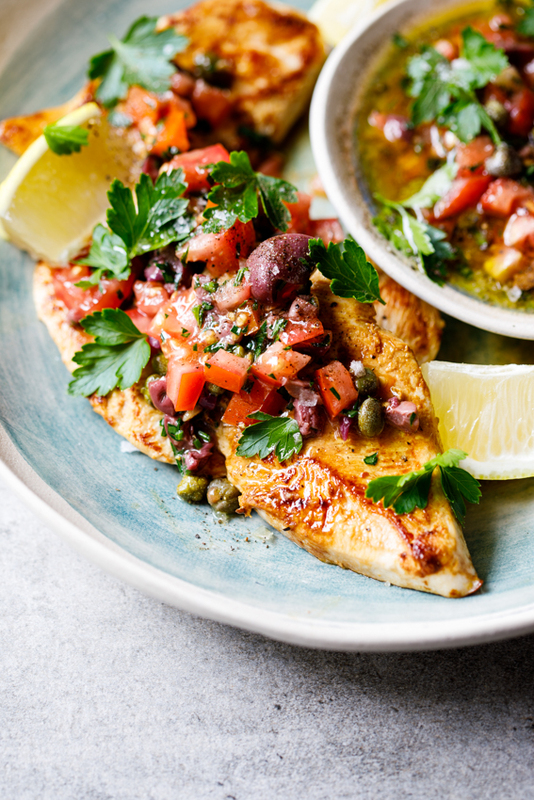 Grilled chicken breasts topped with the most delicious olive, tomato and caper dressing. This is summer eating at its finest. 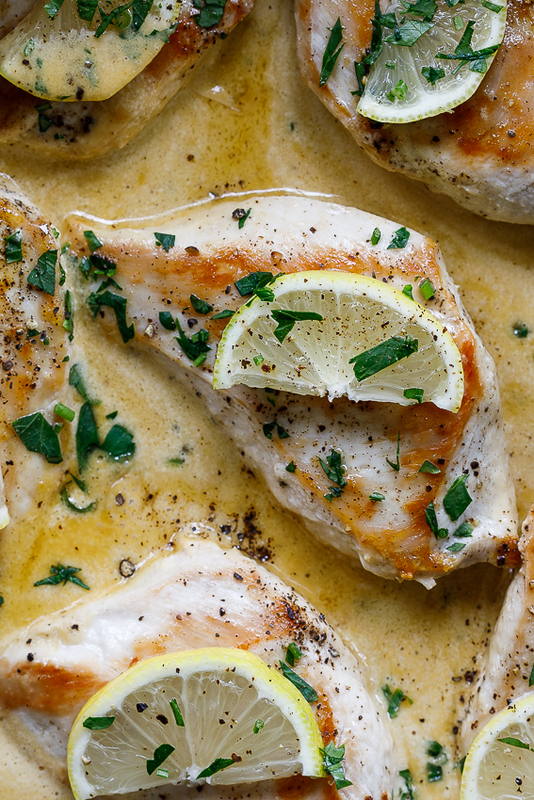 Chicken breasts cooked in a luscious creamy lemon butter sauce is weeknight dinner perfection. 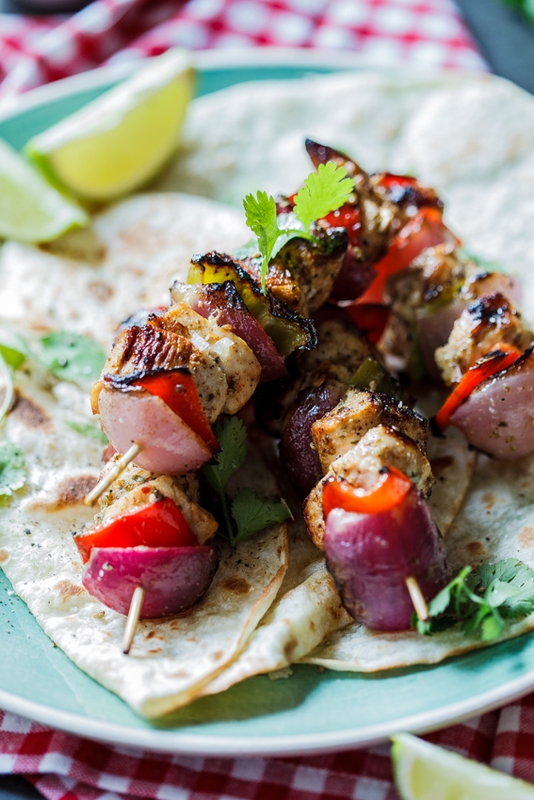 Marinated chicken skewered with peppers and onion, grilled to juicy perfection is a summer staple served with guacamole and tortillas. 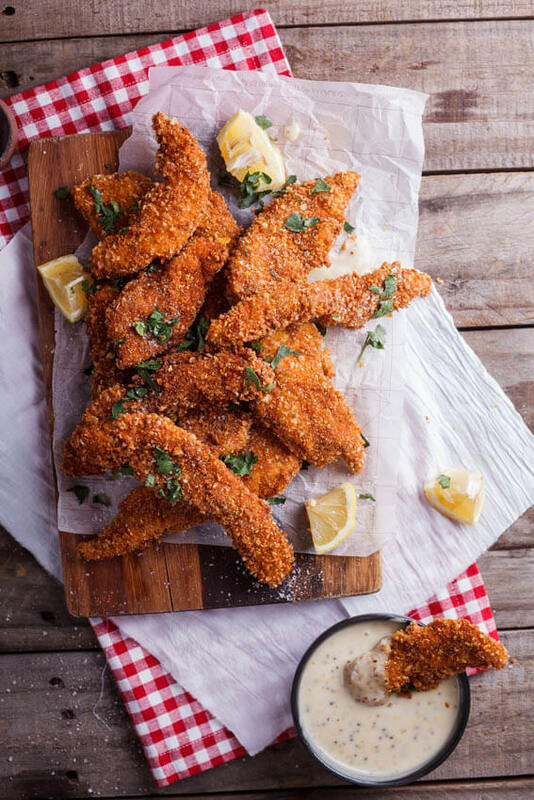 Crispy corn flake crusted chicken strips is a childhood favorite updated served with creamy honey mustard sauce. 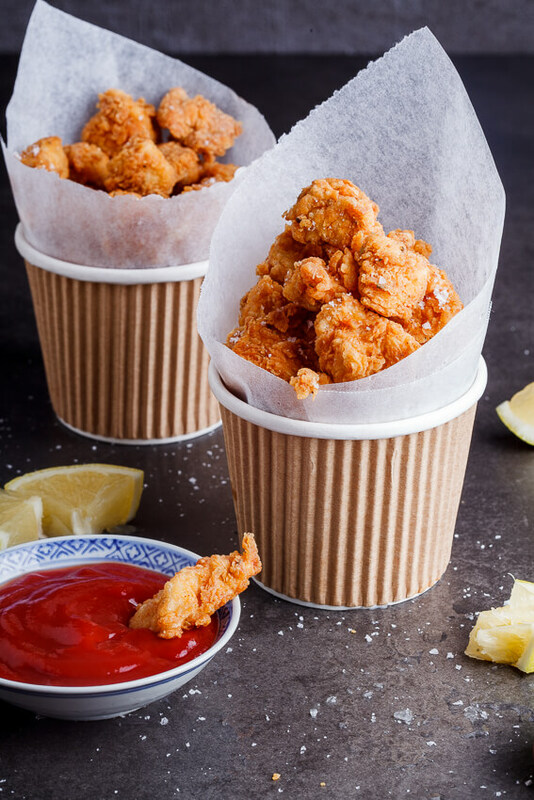 These crispy chicken pops are completely addictive. 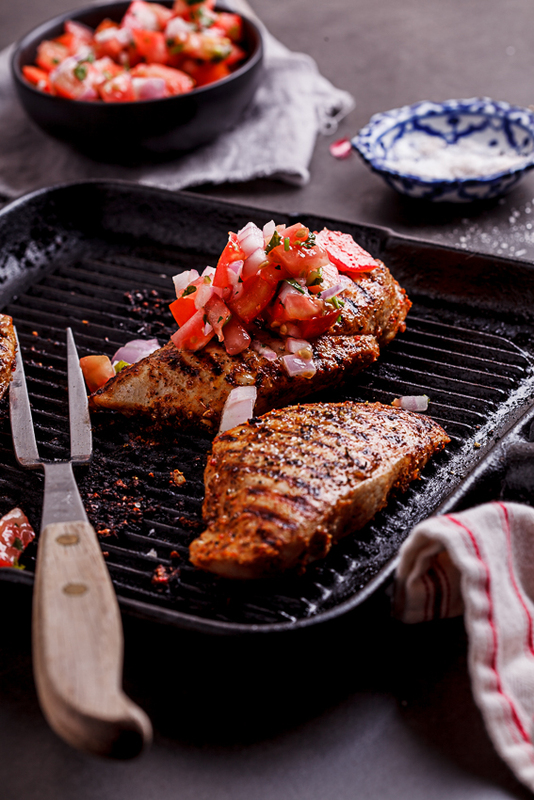 Spicy pico de gallo with grilled Mexican chicken breasts is as perfect as an easy weeknight dinner as it is served to guests for a casual summer meal. 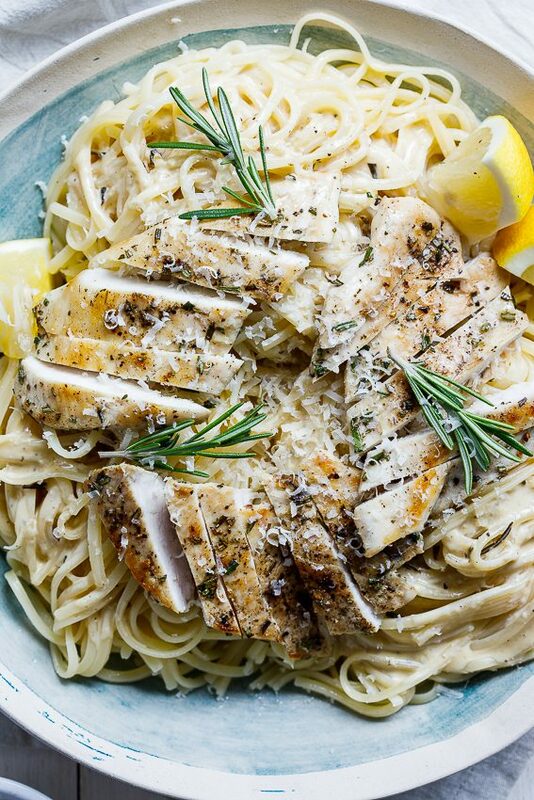 Seared rosemary chicken on creamy pasta with lemon and Parmesan. So delicious! 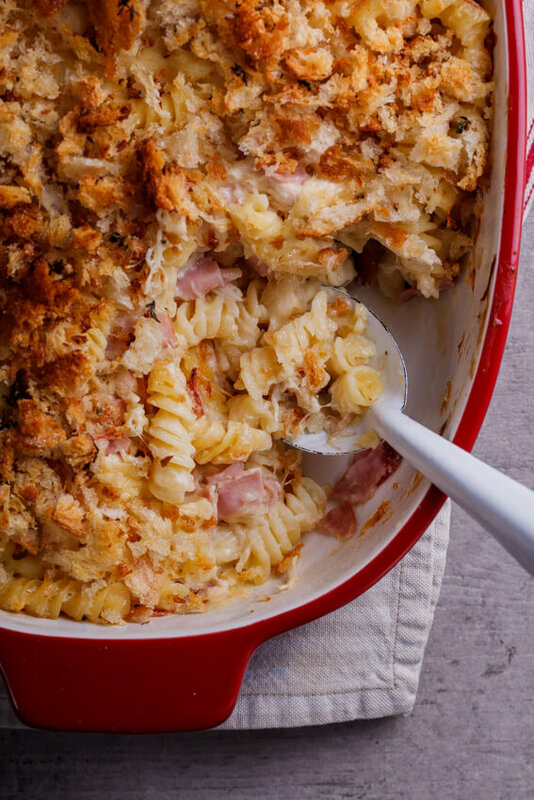 The retro classic becomes a delicious weeknight pasta bake. Yes please! 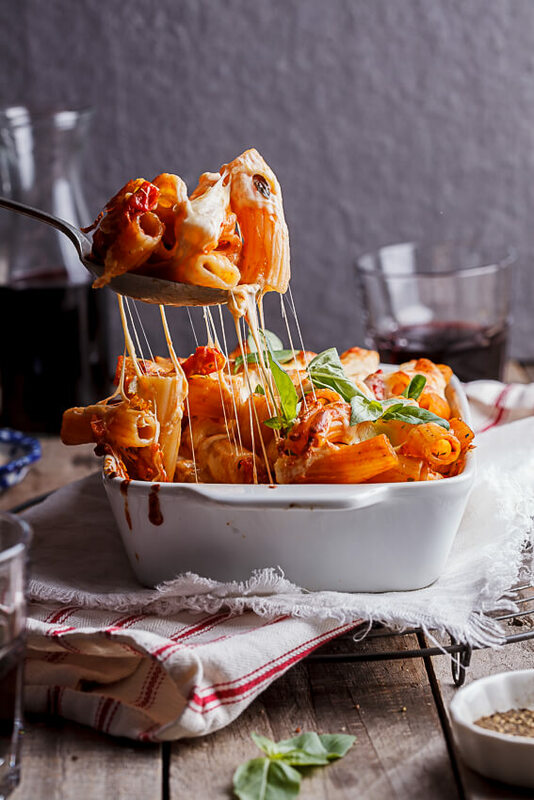 The cheesiest chicken pasta bake with tomatoes and basil. 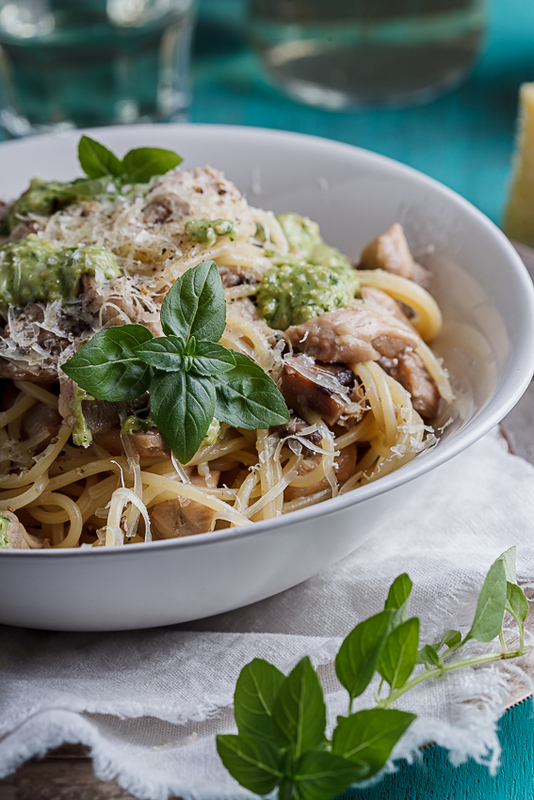 Creamy linguini with chicken, mushrooms and home-made basil pesto. All the flavors of the French classic in an easy pasta recipe. 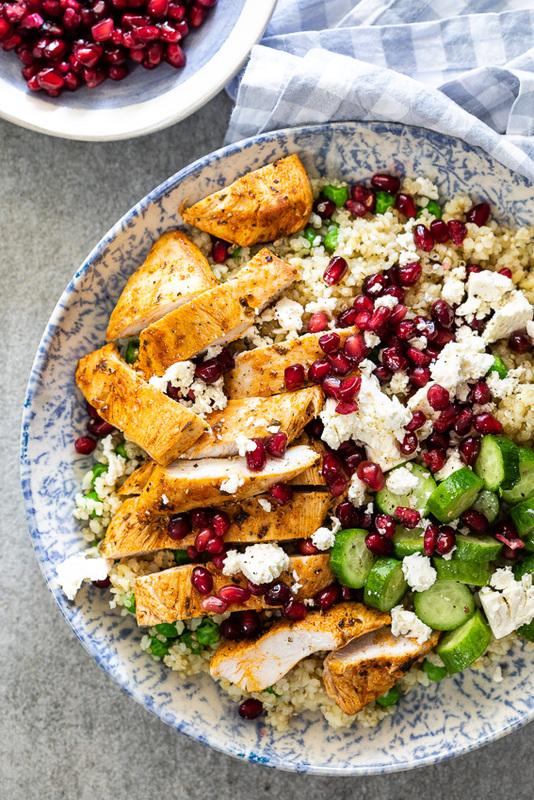 Pan-seared chicken quinoa salad with peas, pomegranate and feta is perfect for meal prepping ahead. 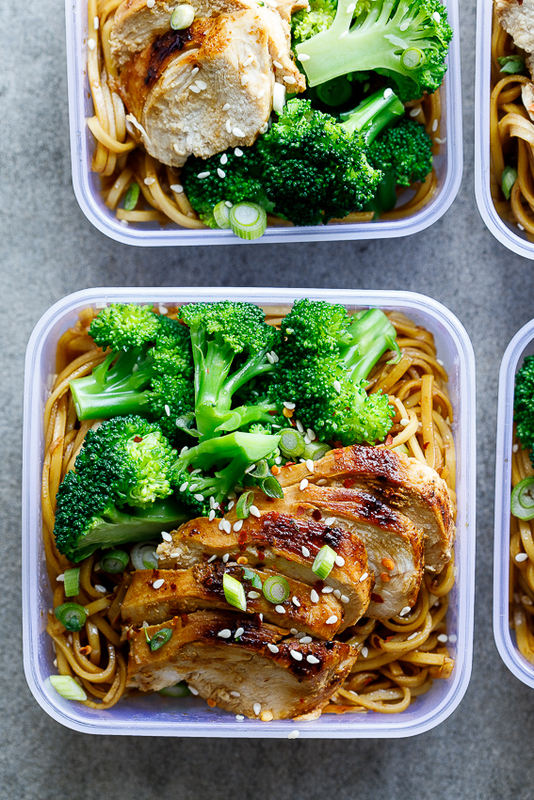 Meal prep this soy honey noodle salad with juicy chicken and crisp-tender broccoli for weekday lunches and you’re winning at life. 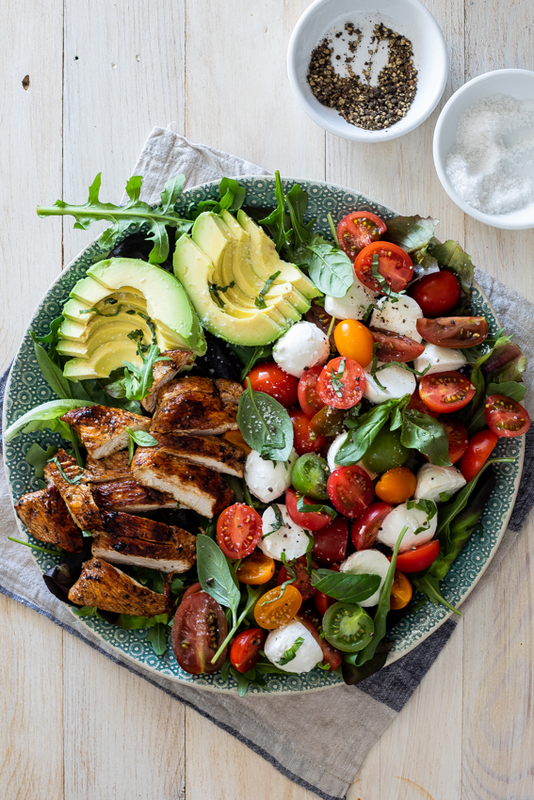 Balsamic-grilled chicken salad with tomatoes, mozzarella, basil and avocado. 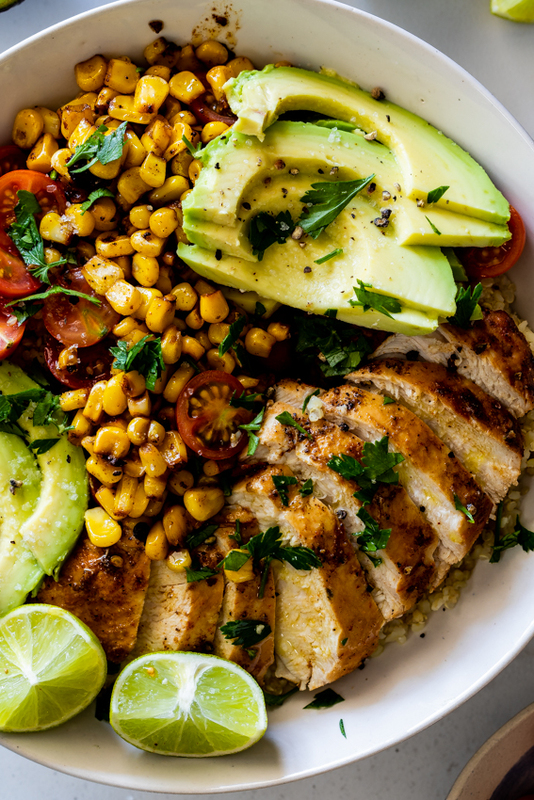 Grilled chicken, toasted corn and avocado on quinoa and bulgur wheat. 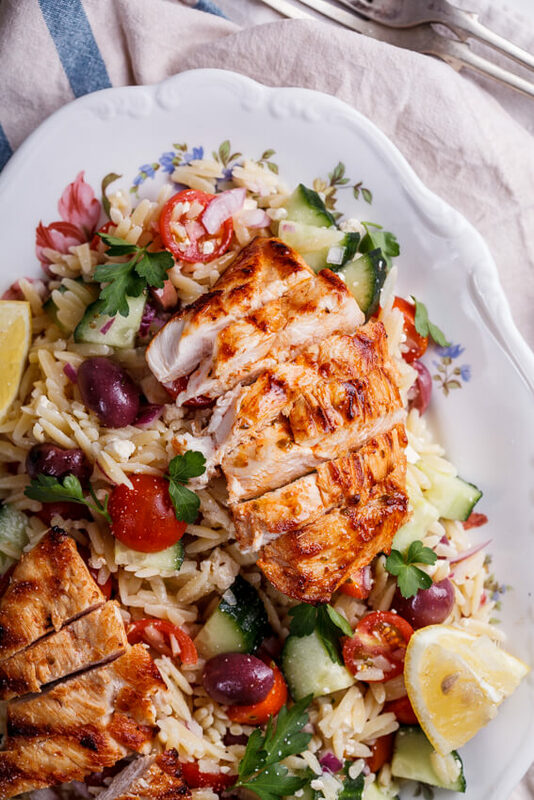 Another meal prep favorite, this Moroccan chicken cous cous salad is just delicious. Gluten free, Low carb and filled with all of the fresh vegetables with a deliciously creamy dressing. 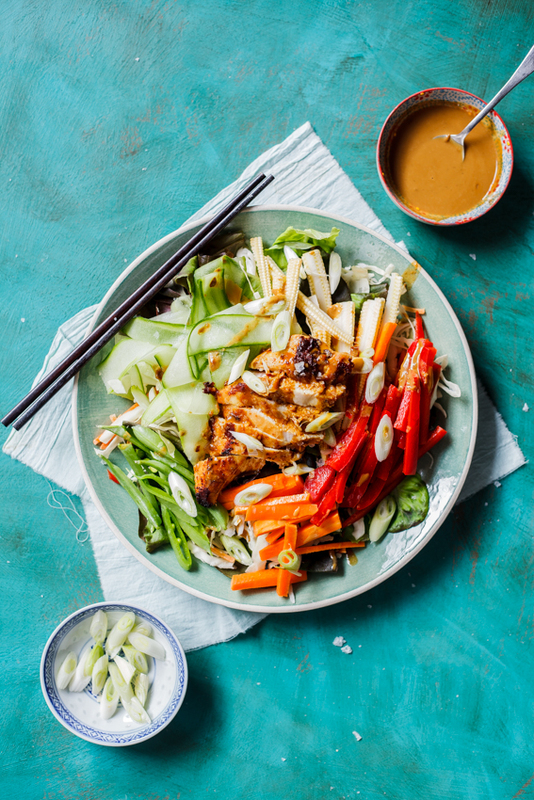 This chicken satay salad is a lunchtime winner. 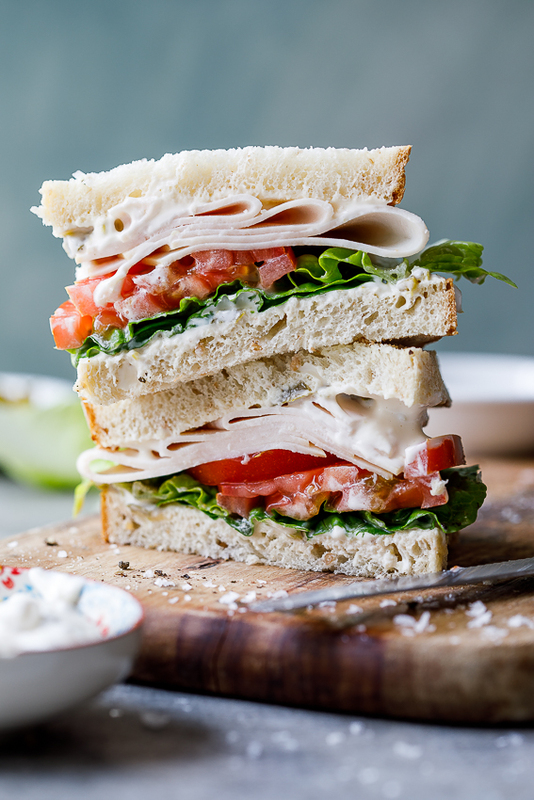 A great make-ahead recipe perfect for lunch or a quick dinner. 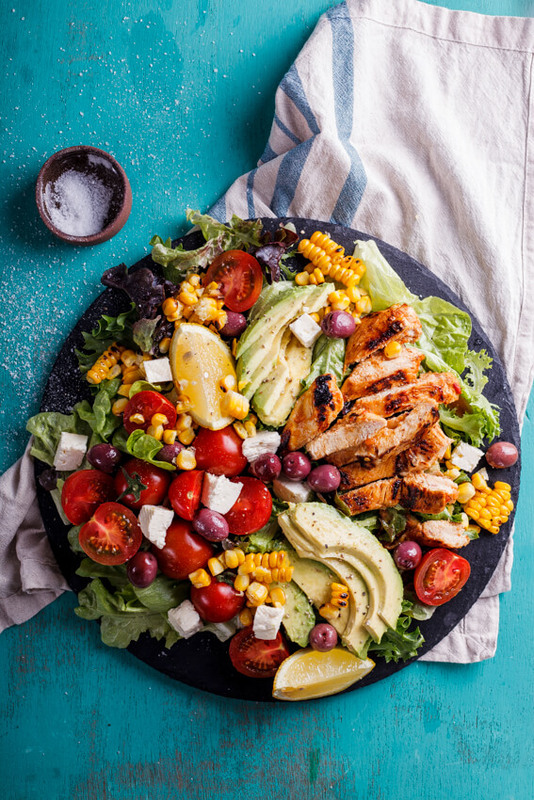 Marinated peri-peri chicken with charred corn, tomatoes, olives and feta. Such a great salad recipe. 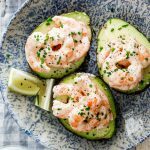 Low carb, easy and completely delicious. 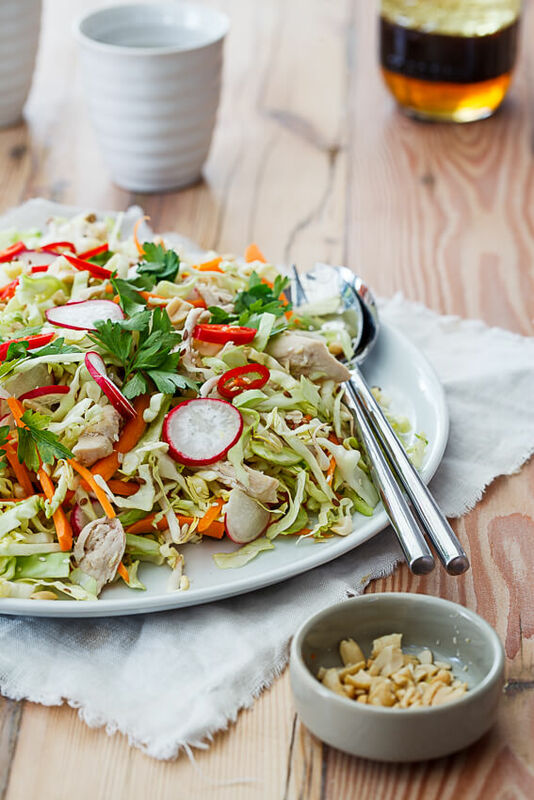 This Chinese chicken salad is the kind of salad I can have for lunch every single day. 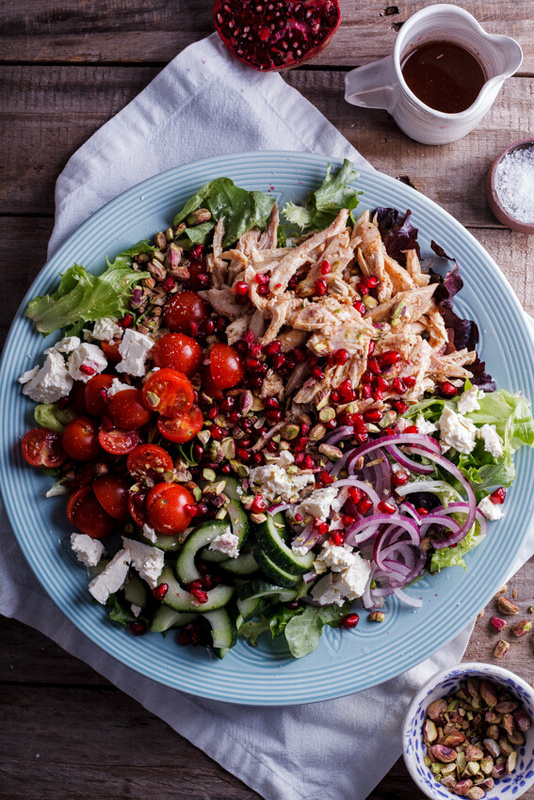 Aromatic spiced pomegranate dressing takes this Moroccan chicken salad to new levels. 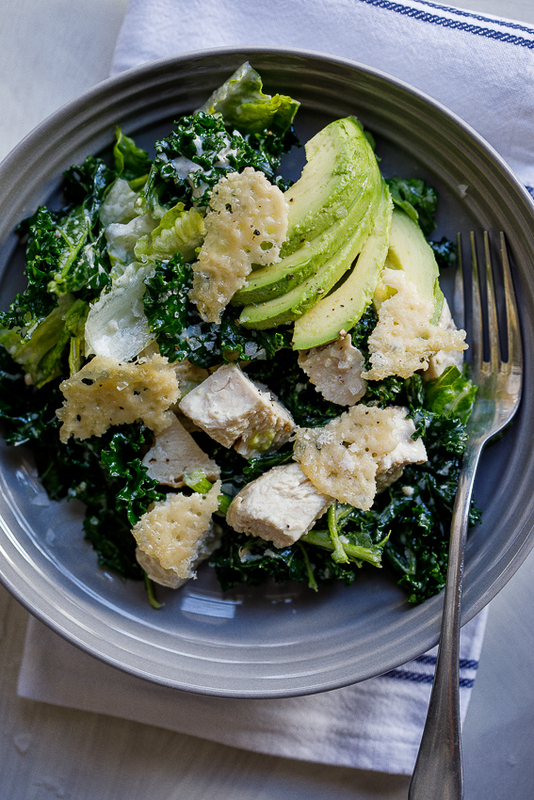 An easy no-egg Caesar salad dressing makes this chicken and kale salad easy and perfect for lunchboxes. 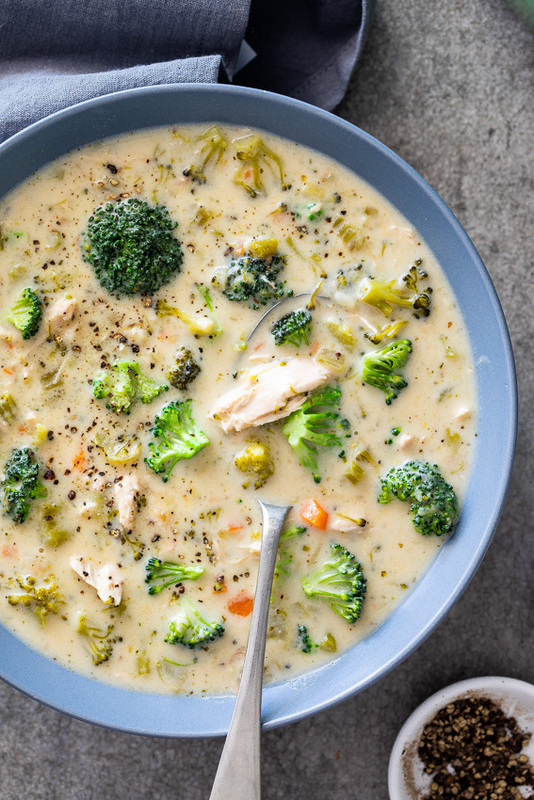 Healthy, easy chicken broccoli soup is perfect for easy weeknight dinners. 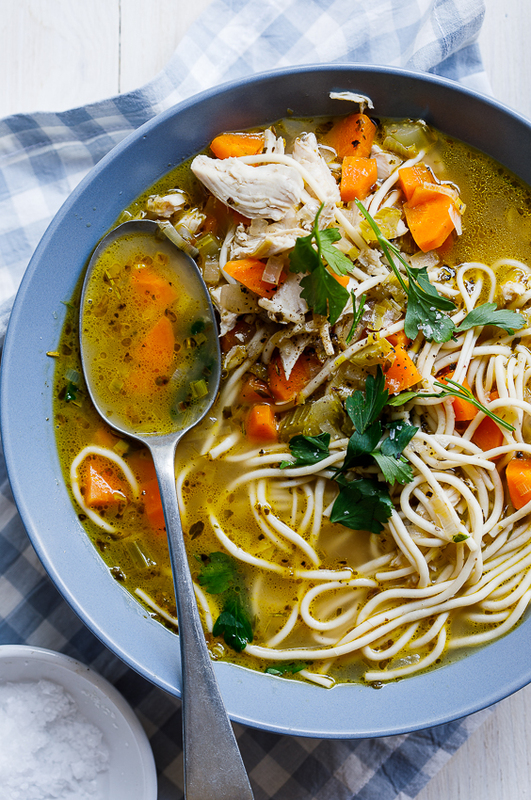 Comfort in a bowl, this chicken noodle soup is super easy and comes together in mere minutes. 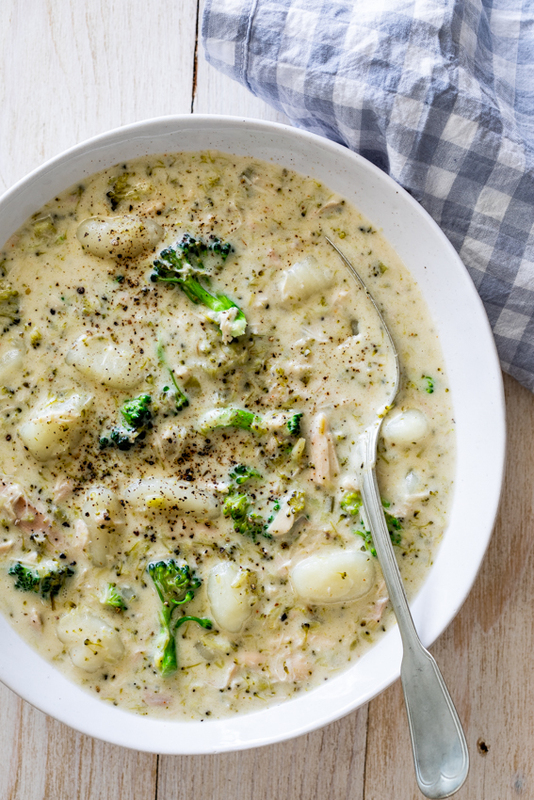 Creamy broccoli chicken gnocchi soup is a creamy one pot recipe perfect for busy weeknights. 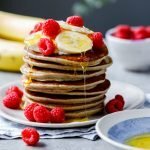 Gluten free, low carb and a winter favorite. 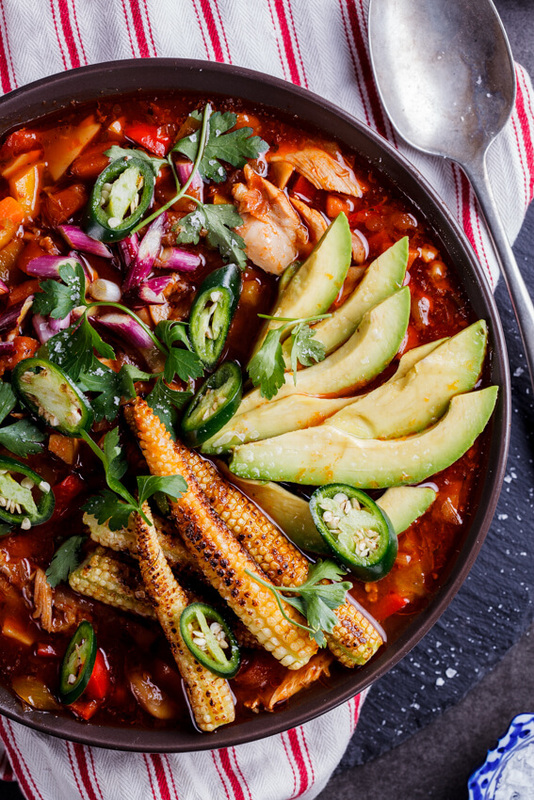 The charred baby corn and creamy avocado are perfect toppings for this aromatic chicken soup recipe. 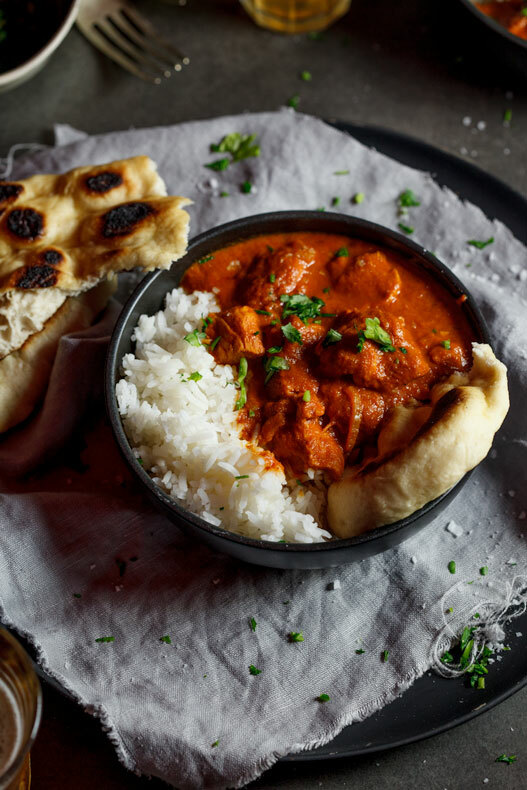 Super easy weeknight chicken curry with roti and cucumber yoghurt. 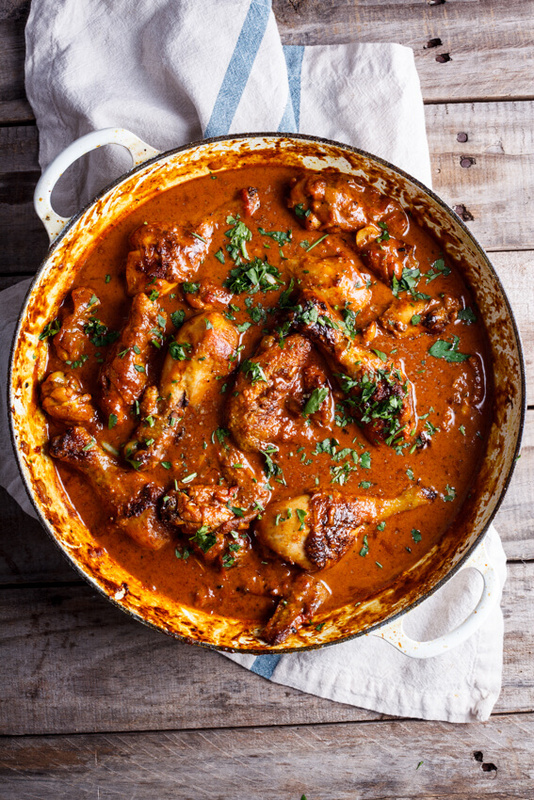 Aromatic Butter chicken curry is an Indian restaurant favorite for a reason. 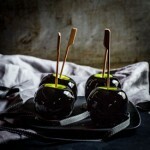 It is absolutely delicious and easy to make. 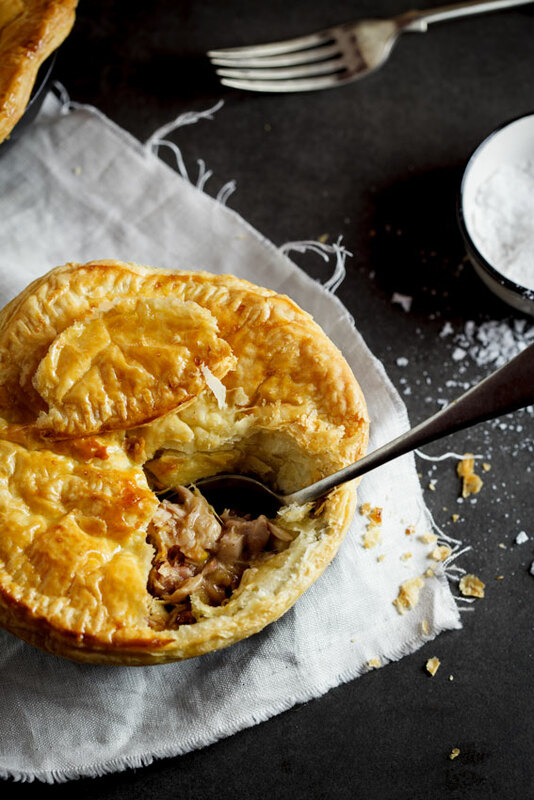 The perfect fuss-free showstopper for dinner guests. 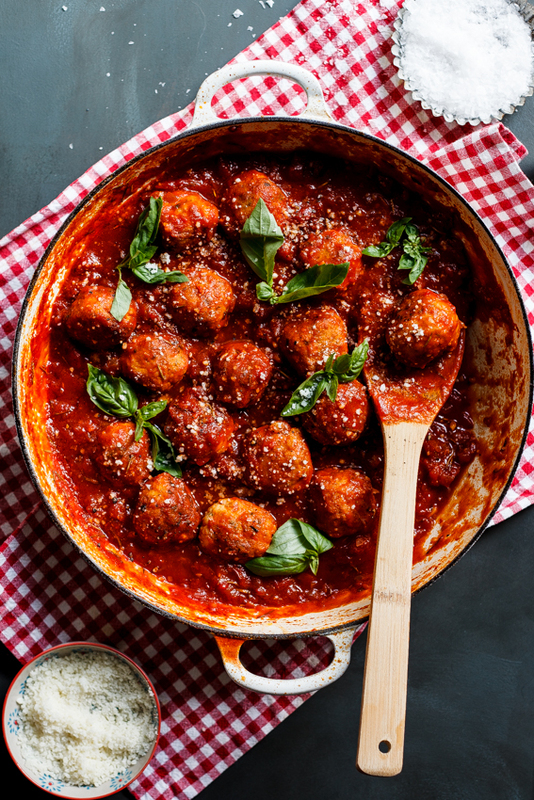 Chicken meatballs stuffed with mozzarella, cooked in a rich tomato sauce. 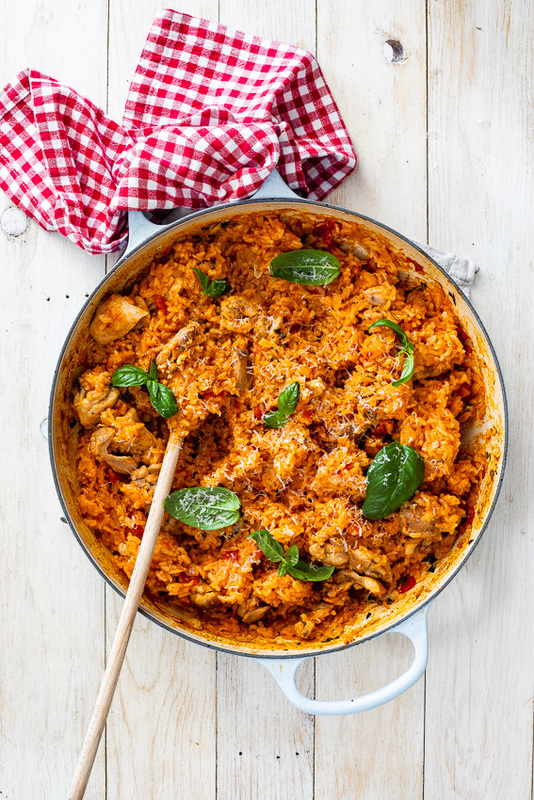 Easy one pot chicken and rice flavored with tomatoes and basil. 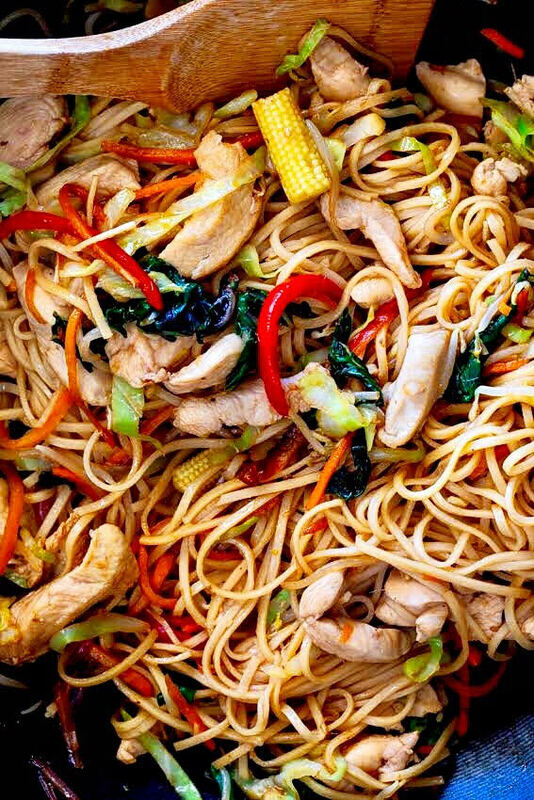 This 20-minute chicken stir fry with easy stir-fry sauce is the ultimate fast weeknight meal. Add noodles or rice, or serve as is for a gluten-free meal. 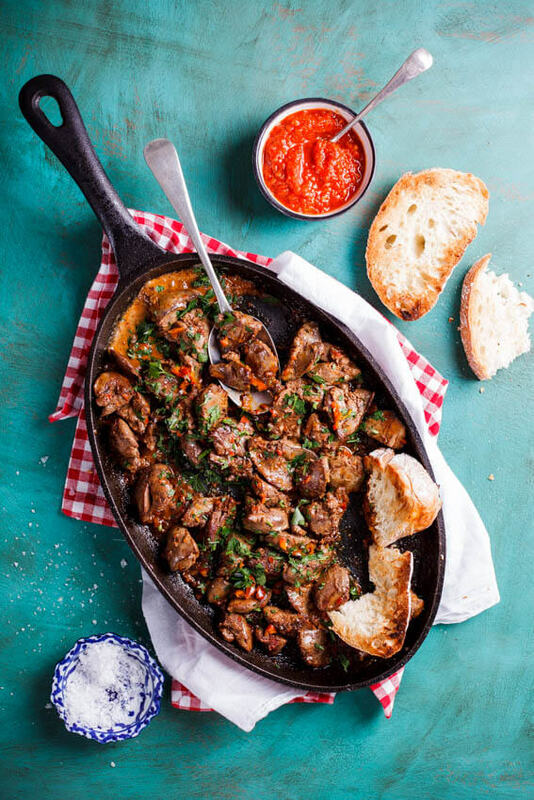 Peri-peri chicken livers is a great way to cook affordable and delicious chicken livers. 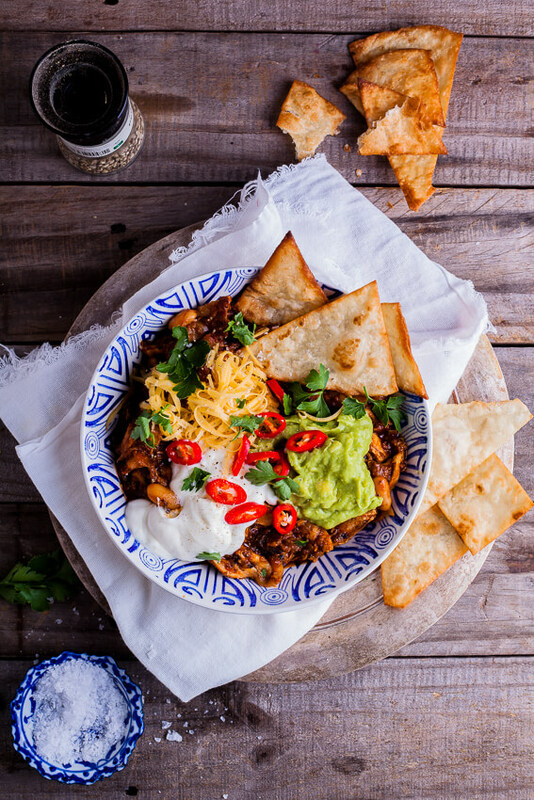 These chili bowls with home-made tortilla chips will be the perfect Superbowl recipe. 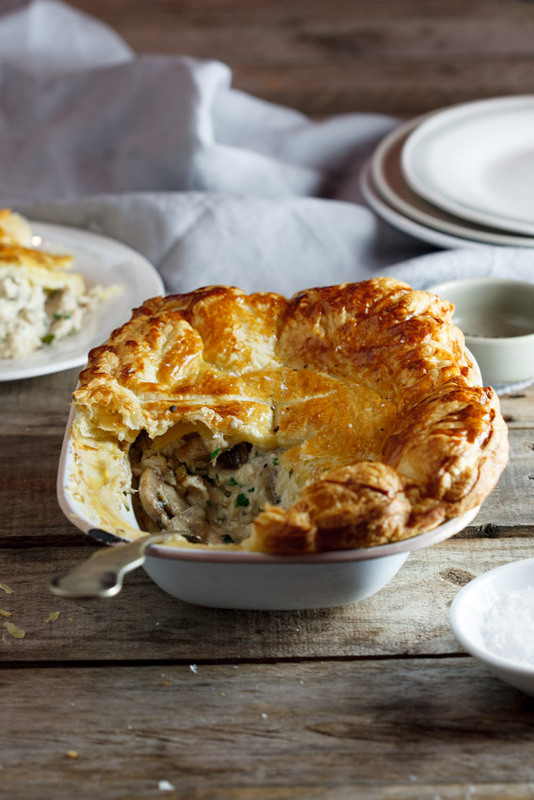 Rotisserie chicken, shop-bought cheese sauce and sour cream come together to make this incredibly easy chicken pot pie. 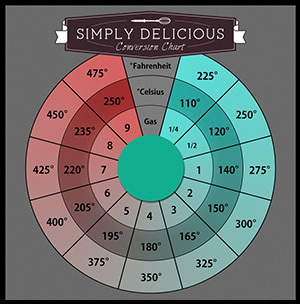 Perfect to make-ahead and freeze for nights when you don’t feel like cooking. 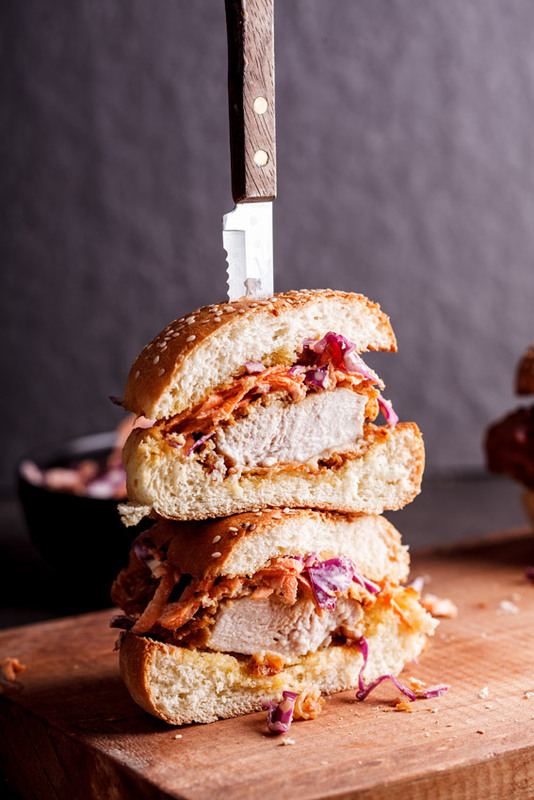 Crunchy and golden fried chicken sandwich with creamy coleslaw. I mean. 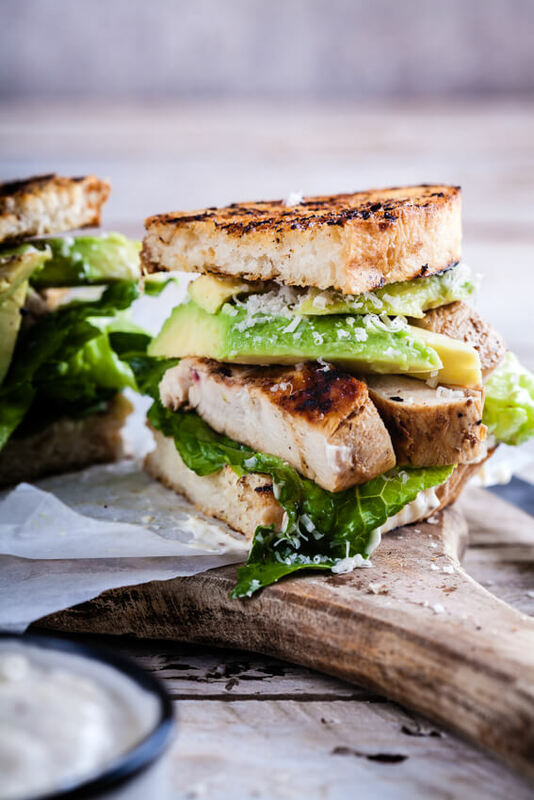 Easy chicken Caesar sandwich with quick Caesar dressing and avocado is a lunchtime treat. 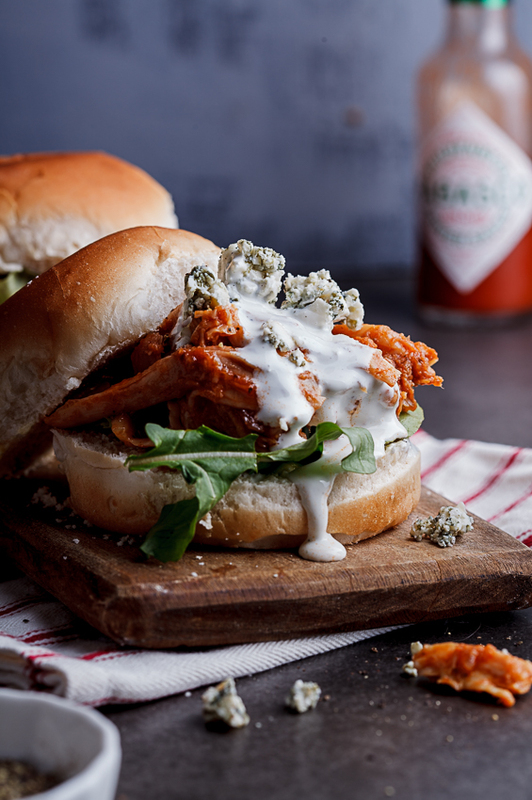 These buffalo chicken sliders are game day food goals with creamy blue cheese sauce. A pork-free BLT with spicy jalapeño mayo. 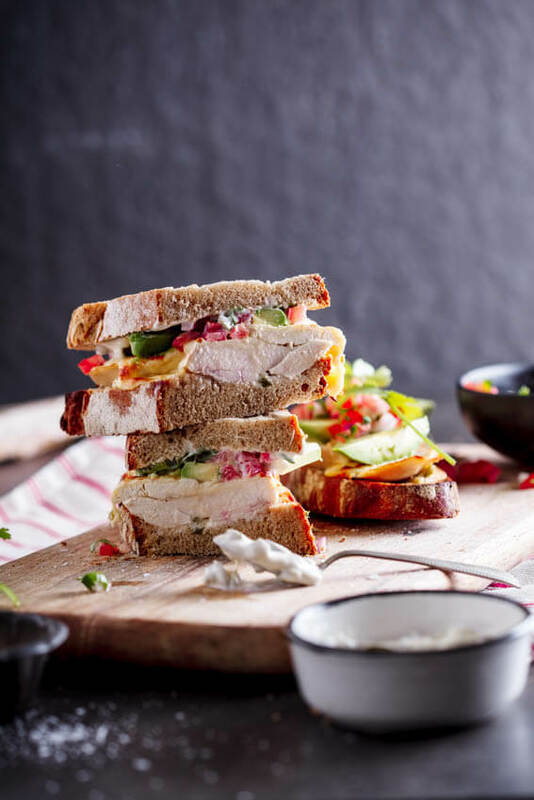 Roasted chicken melts on wholemeal bread with salsa and creamy mayo. 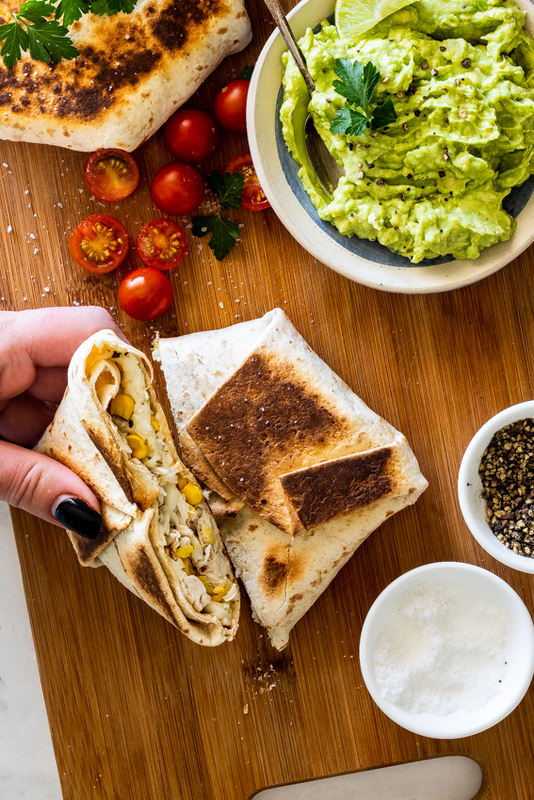 Cheesy chicken and corn toasted in a tortilla served with guacamole. 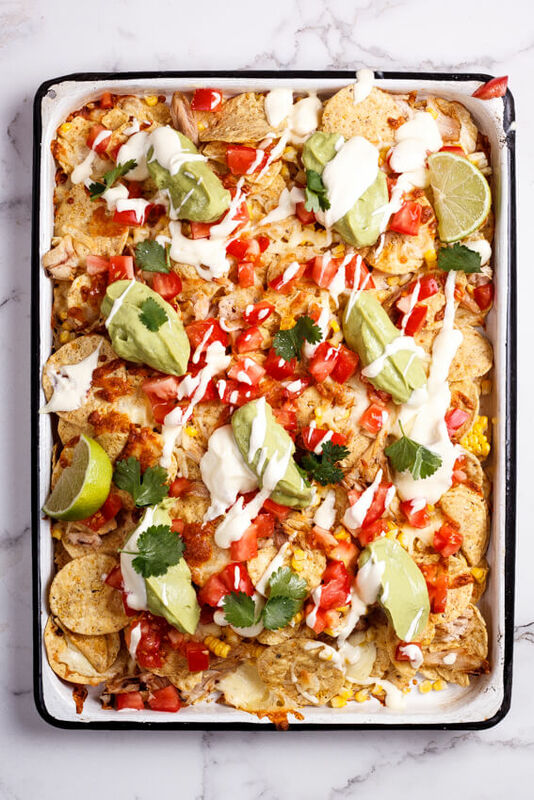 Using shredded rotisserie chicken means these sheetpan nachos come together in no time. 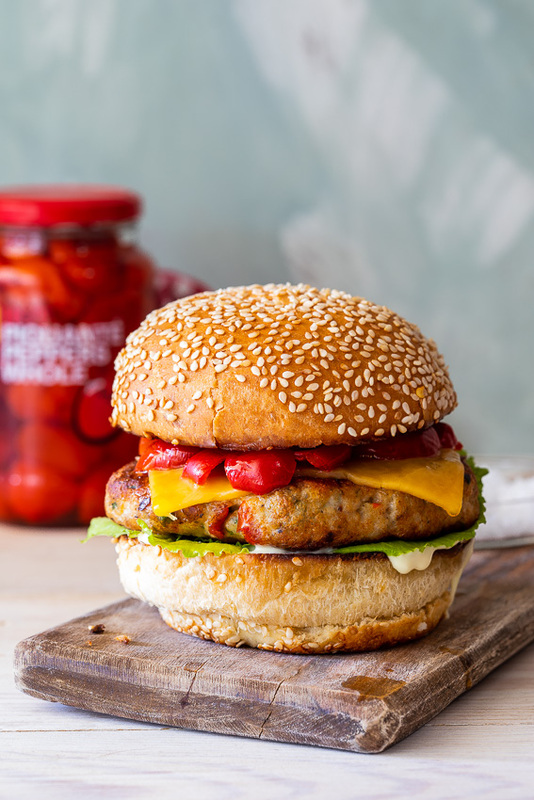 Spicy chicken burgers, great for quick weekend eats. 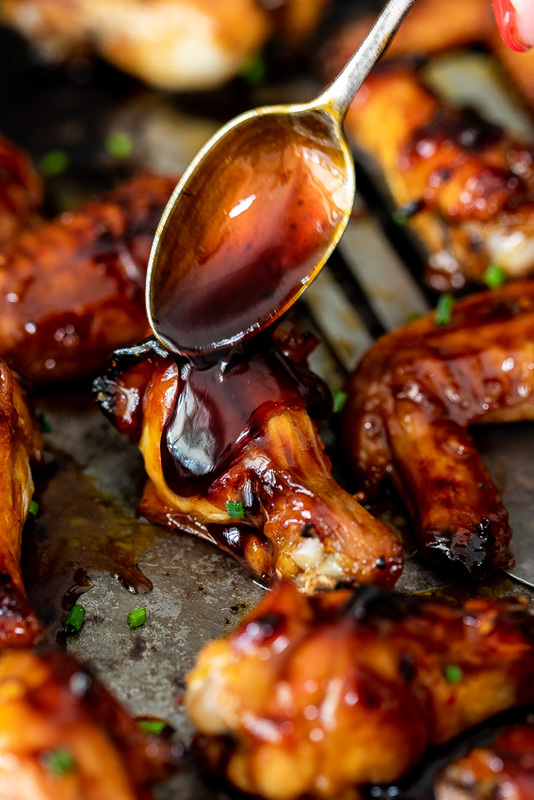 Easy baked chicken wings in a sticky apricot glaze. 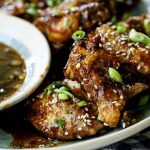 These chicken wings are baked until crisp and golden and then tossed in a delicious Asian glaze. 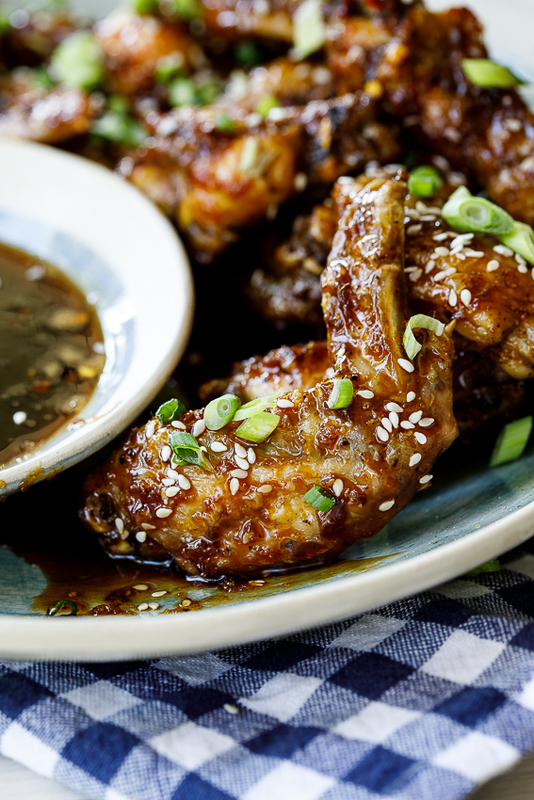 Sticky Sriracha-honey baked chicken wings. What an abundance to share ! Thank you Alida !